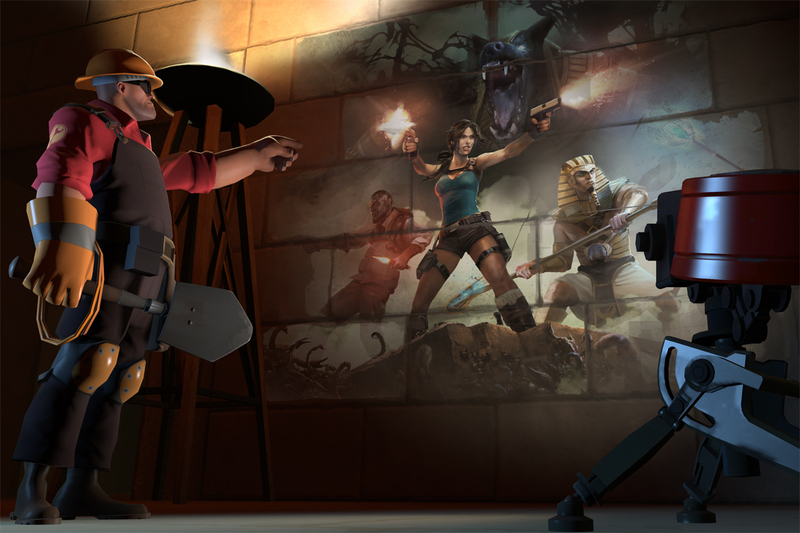 Discussion in 'Team Fortress 2 Talk' started by tf2.com, Nov 3, 2014. One of the best parts about working on Team Fortress is that we have the ability to try new things. Sometimes this means "let's try making Halloween minigames that revolve around bumper cars!" and sometimes, like now, it means "let's try a new way of doing promotions". Rather than working with the developers to have them produce some promotional content for the upcoming Lara Croft and the Temple of Osiris that we hope you'll like, we're involving all of you guys directly — you who submit content to the Workshop and who vote on it. Square Enix has agreed to open up the Tomb Raider IP so that we can have a contest. All of the Tomb Raider games are fair game, so if you've been waiting for your chance to put the heavy in short shorts, this is it. (Please don't do this.) You're welcome to pull from your favorite villains, heroes, levels, or any bit of lore. Because this upcoming game takes place in the classic Tomb Raider universe, we'd like to steer you towards the classic Lara games, rather than focusing on last year's "Tomb Raider". This contest runs through Thursday, November 20th, and we'll announce the winners a few days after that. Whether you're an experienced Workshop contributor or someone thinking about getting their feet wet for the first time, this is a great opportunity to check out the item import tool and get to work. If you aren't interested in submitting content of your own, we're still counting on you to head over to the Workshop and vote on the entries that you want to see in the game. Good luck! Alright, 17 days to make a map. Map? They're talking about workshop submissions. Cosmetics? Is it me or is that shovel placed under the wires on the engies belt? So much Valve related stuff! So much stuff for us to play with! Engineer confirmed for NPC in new Tomb Raider game.